Baltimore's former industrial spaces continue to be reinvented into places of creativity and play, and now a new spot on the Eastside lets participants partake in a primal combination of community and sport. Opened the weekend of July 28 in a Haven Street warehouse adjacent to Monument City Brewing, Urban Axes gives participants an outlet to mix sporting competition, adult beverages, and hand-held blades tumbling through the air as throwers partake in the new, old sport of axe throwing. The sport got its roots in backyard competitions in Canada before moving to more formalized settings. The team behind the Baltimore venue began their American versions of the game in Philadelphia, continuing to expand to other grittier, funkier locales. 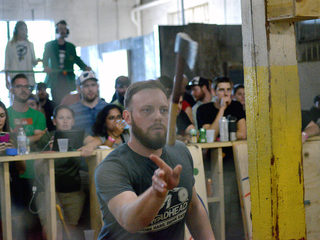 To kick off their inaugural weekend, Urban Axes Baltimore hosted the National Axe Throwing Federation's Urban Open, held for the first time in America. Throwers from Canada, Pittsburgh, Philadelphia, and more converged in Charm City for two days of play, including a skills contest and a double-elimination tournament that yielded a $2500 pot for the winner. Four-time NATF champion Stefan Herda sweated out the tournament title, earning a shiny trophy and a crisp green jacket for his acumen. Those interested in trying out the sport can book a group event, sign up for a league, or just drop in for open hours play. The venue specializes in group events, said Krista Paton, one of the co-owners of Urban Axes Baltimore. From six people to 150, groups can book lanes where they’ll receive instruction on how to throw before participating in their own round-robin style tournament. Particularly satisfying is the percussive reward at the end of each toss. Axes somersault through the air before landing with a pronounced thud into their wooden targets.